Retained Earnings (RE) are the portion of a business’s profitsNet IncomeNet Income is a key line item, not only in the income statement, but in all three core financial statements. While it is arrived at through the income statement, the net profit is also used in both the balance sheet and the cash flow statement. that are not distributed as dividends to shareholders but instead are reserved for reinvestment back into the business. Normally, these funds are used for working capitalNet Working CapitalNet Working Capital (NWC) is the difference between a company's current assets (net of cash) and current liabilities (net of debt) on its balance sheet. It is a measure of a company’s liquidity and its ability to meet short-term obligations as well as fund operations of the business. The ideal position is to and fixed asset purchases (capital expendituresCapital ExpendituresCapital expenditures refer to funds that are used by a company for the purchase, improvement, or maintenance of long-term assets to improve the efficiency) or allotted for paying off debt obligations. Retained Earnings are reported on the balance sheetBalance SheetThe balance sheet is one of the three fundamental financial statements. These statements are key to both financial modeling and accounting. The balance sheet displays the company’s total assets, and how these assets are financed, through either debt or equity. Assets = Liabilities + Equity under the shareholder’s equity section at the end of each accounting period. To calculate RE, the beginning RE balance is added to the net income or loss and then dividend payouts are subtracted. A summary report called a statement of retained earnings is also maintained, outlining the changes in RE for a specific period. Retained earnings represent a useful link between the income statement and the balance sheetBalance SheetThe balance sheet is one of the three fundamental financial statements. These statements are key to both financial modeling and accounting. The balance sheet displays the company’s total assets, and how these assets are financed, through either debt or equity. Assets = Liabilities + Equity, as they are recorded under shareholders’ equity which connects the two statements. The purpose of retaining these earnings can be varied and includes buying new equipment and machines, spending on research and developmentResearch and Development (R&D)Research and Development (R&D) is a process by which a company obtains new knowledge and works on the introduction and improvement of its products and, or other activities that could potentially generate growth for the company. This reinvestment into the company aims to achieve even more earnings in the future. If a company does not believe it can earn a sufficient return on investmentROI Formula (Return on Investment)Return on investment (ROI formula) is a financial ratio used to calculate the benefit an investor will receive in relation to their investment cost. It is most commonly measured as net income divided by the original capital cost of the investment. The higher the ratio, the greater the benefit earned. from those retained earnings (i.e., earn more than their cost of capital) then they will often distribute those earnings to shareholders as dividends or share buybacksShare RepurchaseA share repurchase refers to when the management of a public company decides to buy back company shares that were previously sold to the public. There are several reasons why a company may decide to repurchase its shares. For instance, a company may want to send a market signal that its stock price is likely to increase. 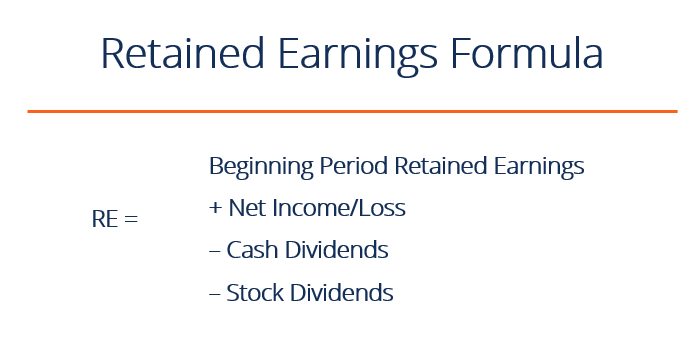 What is the Retained Earnings Formula? 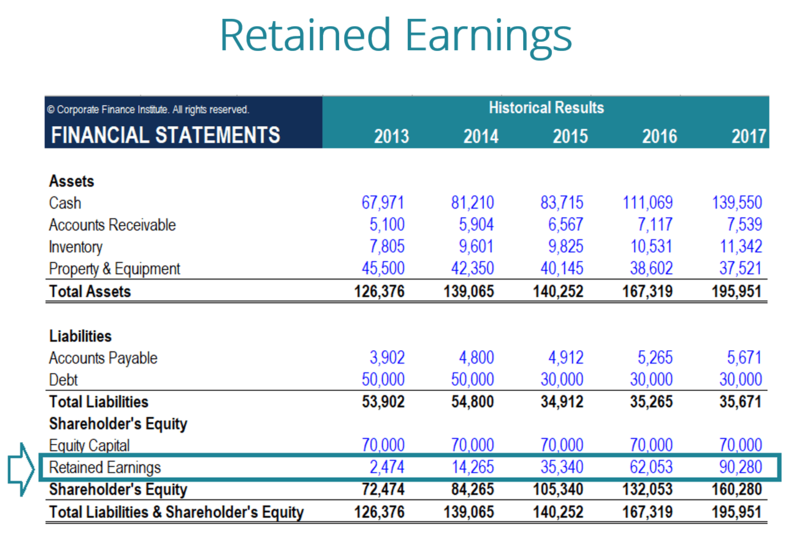 At the end of each accounting period, retained earnings are reported on the balance sheet as the accumulated income from the prior year (including the current year’s income), minus dividends paid to shareholders. In the next accounting cycleYoY (Year over Year)YoY stands for Year over Year and is a type of financial analysis that's useful when comparing time series data. Analysts are able to deduce changes in the quantity or quality of certain business aspects with YoY analysis. In finance, investors usually compare the performance of financial instruments on, the RE ending balance from the previous accounting period will now become the retained earnings beginning balance. The RE balance may not always be a positive number as it may reflect that the current period’s net loss is greater than that of the RE beginning balance. Alternatively, a large distribution of dividends that exceed the retained earnings balance can cause it to go negative. Any changes or movement with net incomeNet IncomeNet Income is a key line item, not only in the income statement, but in all three core financial statements. While it is arrived at through the income statement, the net profit is also used in both the balance sheet and the cash flow statement. will directly impact the RE balance. Factors such as an increase or decrease in net income and incurrence of net loss will pave the way to either business profitability or deficit. 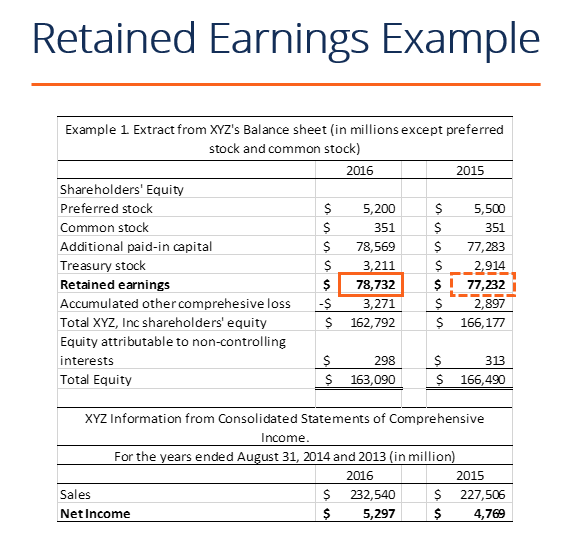 The Retained Earnings account can be negative due to large, cumulative net losses. Naturally, the same items that effect net income effect RE. Examples of these items include sales revenueSales RevenueSales revenue is the starting point of the income statement. Sales or revenue is the money earned from the company providing its goods or services, income, cost of goods sold, depreciation,Depreciation ExpenseDepreciation expense is used to reduce the value of plant, property, and equipment to match its use, and wear and tear over time. Depreciation expense is used to better match the expense of a long-term asset to the revenue it generates. and other operating expenses. Non-cash items such as write-downs or impairmentsImpairmentThe impairment of a fixed asset can be described as an abrupt decrease in fair value due to physical damage, changes in existing laws creating a permanent and stock-based compensationStock Based CompensationStock Based Compensation (also called Share Based Compensation or Equity Compensation) if a way of paying employees, executives, and directors or a company also affect the account. Distribution of dividends to shareholders can be in the form of cash or stockStockWhat is a stock? An individual who owns stock in a company is called a shareholder and is eligible to claim part of the company’s residual assets and earnings (should the company ever be dissolved). The terms "stock", "shares", and "equity" are used interchangeably.. Both forms can reduce the value of RE for the business. Cash dividends represent a cash outflow and are recorded as reductions in the cash account. These reduce the size of a company’s balance sheetBalance SheetThe balance sheet is one of the three fundamental financial statements. These statements are key to both financial modeling and accounting. The balance sheet displays the company’s total assets, and how these assets are financed, through either debt or equity. Assets = Liabilities + Equity and asset value as the company no longer owns part of its liquid assets. Stock dividends, however, do not require a cash outflow. Instead, they reallocate a portion of the RE to common stock and additional paid-in capitalAdditional Paid In CapitalAdditional Paid In Capital (APIC) is the value of share capital above its stated par value and is listed under Shareholders' Equity on the balance sheet. APIC can be created whenever a company issues new shares and can be reduced when a company repurchases its shares. APIC is also commonly referred to as Contributed Surplus. accounts. This allocation does not impact the overall size of the company’s balance sheet, but it does decrease the value of stocks per share. Learn more: how to forecast a company’s balance sheetProjecting Balance Sheet Line ItemsProjecting balance sheet line items involves analyzing working capital, PP&E, debt share capital and net income. This guide will break down step-by-step how to calculate and then forecast each of the line items necessary to forecast a complete balance sheet and build a 3 statement financial model..
At the end of the period, you can calculate your final Retained Earnings balance for the balance sheet by taking the beginning period, adding any net income or net loss, and subtracting any dividends. Below is a short video explanation to help you understand the importance of retained earnings from an accounting perspective. This video is taken from CFI’s Financial Analysis Fundamentals Course. In financial modelingWhat is Financial ModelingFinancial modeling is performed in Excel to forecast a company's financial performance. Overview of what is financial modeling, how & why to build a model. A 3 statement model links income statement, balance sheet, and cash flow statement. More advanced types of financial models are built for valuation, plannnig, and, it’s necessary to have a separate schedule for modeling retained earnings. The schedule uses a corkscrew type calculation, where the current period opening balance is equal to the prior period closing balance. In between the opening and closing balances, the current period net income/loss is added and any dividends are deducted. Finally, the closing balance of the schedule links to the balance sheet. This helps complete the process of linking the 3 financial statements in ExcelHow the 3 Financial Statements are LinkedHow are the 3 financial statements linked together? We explain how to link the 3 financial statements together for financial modeling and valuation in Excel. 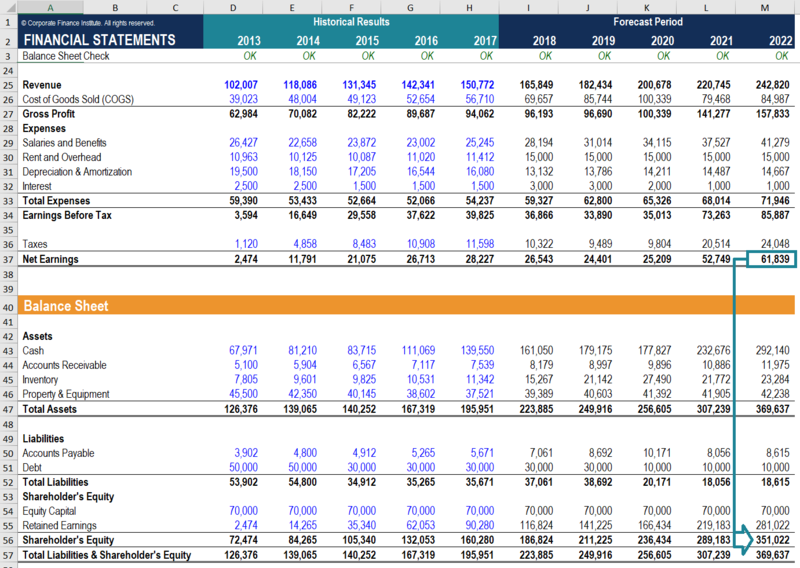 Connections of net income & retained earnings, PP&E, depreciation and amortization, capital expenditures, working capital, financing activities, and cash balance. To learn more, check out our video-based financial modeling courses. The 3 financial statementsThree Financial StatementsThe three financial statements are the income statement, the balance sheet, and the statement of cash flows. These three core statements are intricately linked to each other and this guide will explain how they all fit together. By following the steps below you'll be able to connect the three statements on your own.